iPhone X is here. Mind you, if you haven't already pre-ordered or staked a spot on line at an Apple Store you probably won't be able to get one, but technically iPhone X is finally available for purchase. And based on its unconventional marketing push, Apple really really wants you to want to buy one, even if you don't actually intend to plunk down $1,000-plus dollars. Not that it didn't want you to lust over the iPhone 7 or iPhone 6, but there's something different about the way Apple is hawking iPhone X. With iPhone 8, Apple is selling a new phone: better processor, better camera, new color. With iPhone X, it's selling an experience. 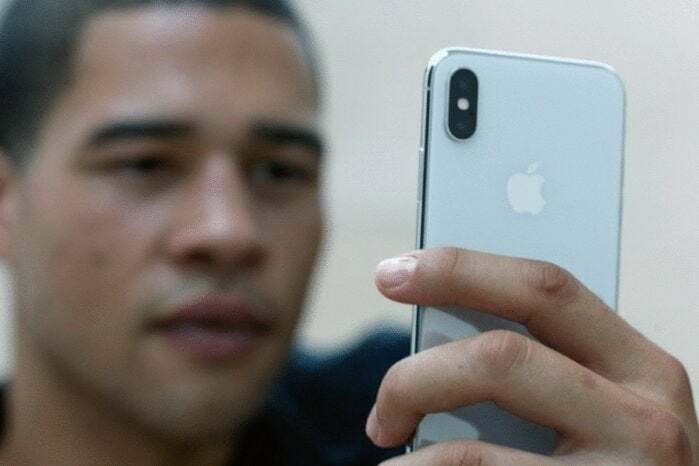 From the YouTube first impression videos to celebrity retweets and rolling reviews, iPhone X is being presented not as a device but a phenomenon. Like a summer blockbuster, iPhone X is the new thing that everyone's talking about. And if you're not buying it, you need to see it. And once you see it, you'll want one. In some ways, Apple is treating iPhone X more like Apple Watch than a phone. With its first wearable, Apple wanted to sell it to customers as a piece of jewelry rather than a piece of technology. It was about fashion and connection rather than battery life and speed, and that mentality propelled Apple Watch to become the best selling watch—not just smartwatch, overall watch—in the world. 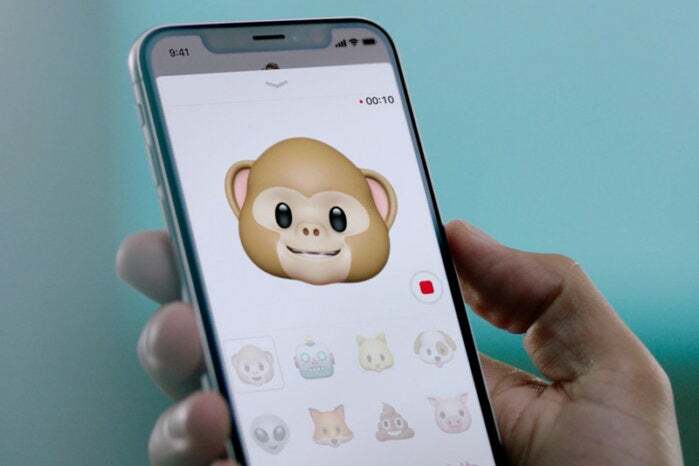 Of course, the iPhone is already the best selling smartphone on the planet, but iPhone X represents a whole new animal. Much like the original iPhone, iPhone X represents the next 10 years of Apple's mobile strategy, but this time around it's not just "a revolutionary mobile phone." iPhone X is a lifestyle device, the first iPhone in years that needs to be seen. So, Apple took a very different tack with the lead-up to the iPhone X launch. It encouraged lines at Apple stores. It gave a small faction of YouTube stars hands-on access before traditional outlets. It gave most reviewers a 24-hour window to organize their thoughts. And in perhaps the most un-Apple move of all time, it collected the most glowing comments and out them in a press release. 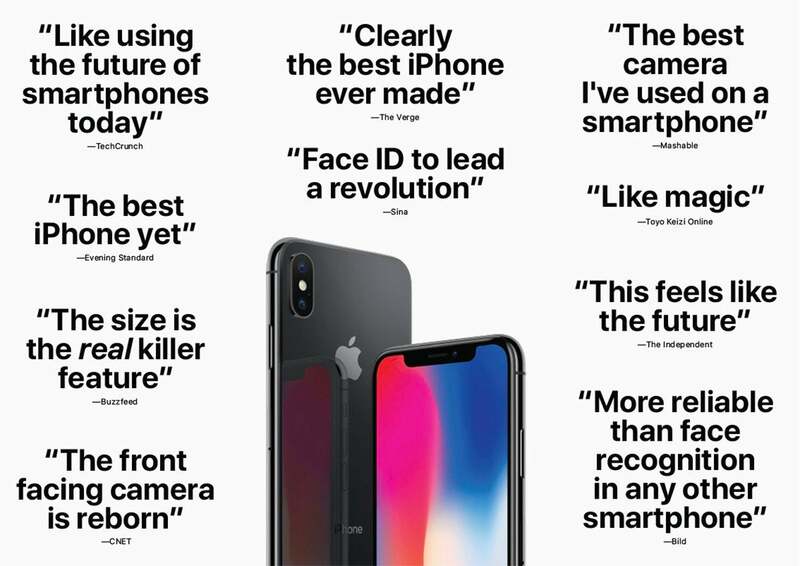 Apple spotlighted snippets of iPhone X reviews in a glowing press release. Now, you could say Apple is desperately trying to control the iPhone X conversation with this strategy, and maybe it is. Most of the reaction we've seen has been after short stints with the device, and problems are far more likely to crop up after days rather than hours. Plus, with a slow rollout it can avoid a pile of issues like it experienced with Apple Watch Series 3's cellular issues. But I'd argue the opposite, that Apple is more confident in iPhone X than any other product its released. Above all, Apple wants to show that there isn't a steep learning curve with iPhone X, and the shortened window for reviews helps illustrate that point, however subtly. But Apple's main motivation with all these iPhone X first looks is to put a focus on its fun features rather than specs. That's plain to see in the YouTube videos that were heavy on entertainment and light on examination. But even the transitional outlets focused more on Face ID and the new design rather than battery benchmarks and speed tests. Apple needs the core features of iPhone X—buttonless navigation, hands-free unlocking, and yes, the notch—to become ingrained in its culture even before most people are able to buy one. And even before iPhone X releases, Apple is already laying the groundwork for it to take over. With three flagship models this year, Apple doesn't need to move large numbers of iPhone Xs. Based on its first quarter guidance, Apple plans to move a metric ton of iPhones over the next couple months, and a lot of those sales will be due to the appeal of iPhone X, even if they end up buying an iPhone 8 instead. The whole point of iPhone X is to showcase the future of Apple's smartphone strategy. It's not about me-too features like the OLED screen, to the edge-to-edge design. It's a sneak peak, albeit one you can buy for $999. For many buyers, money won't be an object. The cost of a top-of-the-line iPhone X on the iPhone Upgrade Program versus a top-of-the-line iPhone 8 Plus is $16 a month, a premium for sure, but not nearly as painful as the $400 up-front cost. Based on the 5- to 6-week delay in shipments on Apple.com, Apple has already sold millions of its new iPhone X, and there are millions and millions more in the pipeline. But whether Apple sells more iPhone Xs in the holiday quarter than iPhone 8s isn't the issue. It's about impressions. When iPhone X was first announced, the reaction was somewhat muted. There were concerns about Face ID. People wondered if it was worth such a premium over iPhone 8 Plus. Some even started questioning whether Apple "all screen" claim was even accurate. But that too plays right into Apple's marketing strategy. Apple knew there would be questions about iPhone X. But with one fell swoop of first impressions, Apple dispelled all naysaying. Face ID works. The screen is amazing. And it's worth the extra money if you can afford it. Even if you don't buy an iPhone X today, tomorrow, or next month, Apple has planted the seed of desire. It doesn't matter if you watched Booredatwork's video, read Matthew Panzarino's review, or followed Recode's discontent. People who were already going to buy an iPhone X really want one now. But more importantly, a whole group of people who normally might not care about an iPhone launch weekend will go to the Apple Store this weekend to get a glimpse of the new iPhone. They'll try it out. They'll tweet out pics. And they'll tell their friends that they need to go see it too. And if they have $1,000 burning a hole in their pocket, they'll buy one whenever it's available.